Best known for their sometimes racy but always memorable Super Bowl commercials, GoDaddy’s online marketing efforts are equally impressive. The world’s leading domain registrar expertly utilizes Twitter, Facebook, Google+, and YouTube to promote its services via light-hearted memes, instructional videos, timely commentary, discount promotions, and coupon codes. Further, we know of no other company that makes better use of e-mail in anticipating and meeting its customers’ domain registration and hosting needs. GoDaddy clearly understands the mutual benefits associated with a customer-centric marketing approach. No other web host’s online marketing efforts even come close. 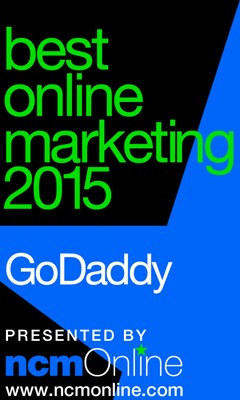 NCM Online is proud to present its Best Online Marketing Award for 2015 to GoDaddy.